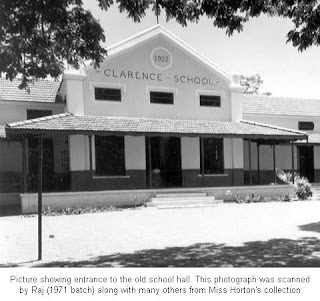 The best years of my school life were spent in Clarence High School, Bangalore. This is a Christian school affiliated to Bethesda (Brethren) Church. Scripture was compulsory as a subject, and many of the scripture passages I know from memory were learnt during my scripture classes there. The school principal was Mr. A.C.Flack, an Australian. He seemed to know everyone of his students and even where they lived. One day, I lost my cycle key in school and was trying to find a locksmith, when I very nearly collided into Mr. Flack outside the small gate near the peepul tree. With the help of a friend, I carried my cycle all the way home. In the evening, my mother and I were surprised to see Mr. Flack at our door with the key, which he had found somewhere in the school premises. Another time, just shortly before I took my board exams, he came home and advised me to get up from my books every hour or so and do a bit of skipping to improve circulation. I am sure he did not single me out for such kindness. All his students have wonderful stories to relate about this man, and the naughty ones certainly remember the caning sessions as well. Whether it was obvious to others or not, I do not know, but I was keenly aware that although he did not thrust religion down anyone’s throat, but only shared the gospel when it was his turn at morning assembly, he had a heart that was on fire for the Lord. This conviction was once put to the test. One time, I found myself in the middle of a discussion with my Geography teacher, who was Hindu, about my faith. I said that Jesus claimed to be the only Way to reach heaven, and that there was no other way according to Him. She was incredulous and said that it sounded so narrow minded. Hinduism is accepting of all faiths, holding to the belief that God is one and all religions teach the same basic principles of love and good works and lead people to God. Christianity preached in its pure form must naturally seem very bigoted and wrong, unless God Himself condescended to shed His light. I assured her that this was what the Bible said, and we could accept it or reject it. However, I pointed out, there was so much of evidence that the Bible was the word of God Himself, and so we must give the matter a lot of thought before rejecting it. She was a wonderful person and her horrified reaction was legitimate. She felt that I was mistaken and that Mr. Flack, who was so reasonable, would certainly not agree with me. I said that we could go and ask him. Soon we were outside Mr. Flack’s office, and he beckoned us in. After I explained the matter to him, he welcomed her to sit down. Finding myself in a room with two faculty members, and being just a student myself, I excused myself and left. I have no doubt that he would have handled the matter ably. He died a few years later in Australia. The old school hall was brought down. I remember that hall so well, with its dark floor of kadappa stone slabs, wooden benches, simple wooden tiers for the choir, school gong (whose regular use had already been replaced by the siren), and a picture of Shakespeare to whom, apparently, I bore a physical likeness, if my friends are to be believed. At the back of the stage was the bookshelf that was the Sunday school library with its quaint collection of the loveliest old books. Only the Sunday school children would have known of its existence. In place of the old hall, a modern hall, Flack Memorial Auditorium, was built that, with its gallery, had a larger seating capacity. It was the end of an era. My husband Philip and I were married in Flack Memorial Auditorium in 1986. Another spiritual mentor from those school years, Miss Horton, was an honoured guest at our wedding. More about her next. Next John Piper heard God actually speaking! Oh yes I do remember the caning one recieved from Mr Flack, but what I recall was his sense of fairness. We had a bully in our class, who liked to beat up most of the guys, one day I got some grease from the steam engines passing by, and rubbed it on the fellow’s head. I was taken to Mr Flack. Strange punishment, but it sure stopped the bully from his antics after that. Strangely he didn’t cane me that day! I was a student at Clarence from 1943 to 1953. Mr. Flack had an important effect on my life. He was an inspirational teacher and showed us how to behave. I have lived in the USA, Australia and England but always have fond memories of Clarence, Mr.Flack, MR.Hobday and the physics teacher. It was nice to see the picture of the old school building. Even after fifty years still remember the School ssembly and hymn. nice words. my father, hal henning, worked at clarence from 1959 to 1969. i was born in bangalore in 1966 and left in 1969. i can’t remember a thing about it but i miss it. strange isn’t it? love. jim. Hello Jim, I just came across your post and it took me back to my years in Clarence. I was a student there from 1960 to 1970, and on staff from 1976 to 1980. My mother Mercy Chandrasekharan was a teacher at Clarence for 25 years and your Dad Mr. Henning was very much a part of our school life. Tall and silver haired, he would make us laugh by moving his scalp; I’ve never seen anyone else do that! Tell him he is fondly remembered:) God bless, Chitra. Thanks, Chitra. Love your memory. Dad was always making people laugh. Unfortunately he passed away in 2006 but he will definitely be in heaven so all good! nice words. my father, hal henning, worked in clarence from 1959 to 1969. i was born there in 1966 and left in 1969. i can’t remember a thing about the place but i miss it a lot. strange isn’t it? love. jim.